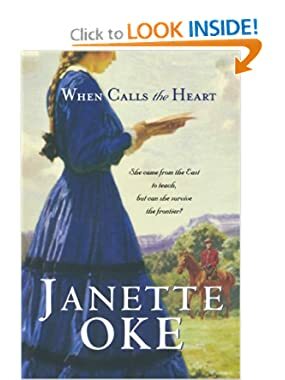 I should probably start this review with a confession, Janette Oke has been one of my favorite authors for years and years. There is just something about the time period she sets her books in and her ability to develop characters as the stories progress that has always captured me. 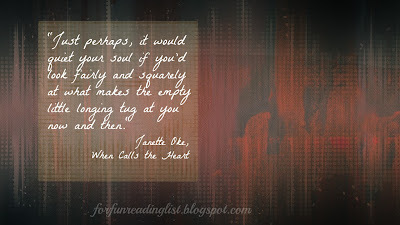 With that said, here are my thoughts on When Calls the Heart. As the first in the Canadian West series, When Calls the Heart introduces some wonderful characters and paints a beautiful picture of historical Canada. Elizabeth is a well-off East-coast young lady when the book starts. But quickly her life takes an unexpected change and she finds herself on the Canadian frontier as a school teacher to a community that has never had a proper teacher before. We follow Elizabeth as she learns to live on the frontier in her own house, adores the country children in her school and finds herself falling for a man who says he doesn't have the ability to love a woman properly. Wynn Delaney, the object of Elizabeth's infatuation, is one of those characters that I feel defines Janette Oke's characters. Sure on the surface he appears to be perfect, but as the story continues we realize he has flaws like everyone else. Yet you can't help but keep your fingers crossed that he will change his mind and find a way to really love Elizabeth. I always enjoy these historical fiction books because the action that connects the major plot points are focused on every day challenges and obstacles. For example, for a little while Elizabeth's small home becomes the home of mice, which she can't quite get herself to exterminate on her own. As result there are a series of comical moments when neighbors aid in her dilemma. And as a Christian Fiction book there is thread of how God is the master Designer, and for those who trust in Him, there will be hope and comfort. I realize this book is a bit older, and I'm guessing a few of you have already read it - so if you have please tell me what you remember! I wanted to share this book with you all now because I've heard rumors that it is being made into a movie, that might be coming out later this year - have you heard rumors also? Let me know if you have details! Are you a historical Christian fiction fan? Have you read Janette Oke? Who is your favorite historical Christian fiction author? I'd love to hear from you! *There are affiliate links included in this post, but the opinions shared are my own.